The new “it” place to stay in Breckenridge! Talk about location: Main Street and the Quicksilver Super6 chairlift are both an easy five-minute stroll away. And the resort amenities are fabulous: a beautiful heated indoor/outdoor swimming pool, seven hot tubs, a fitness center, club lounge, ski locker room, ice skating on Maggie Pond and more. It’s the complete mountain vacation setting for you, your family and friends! 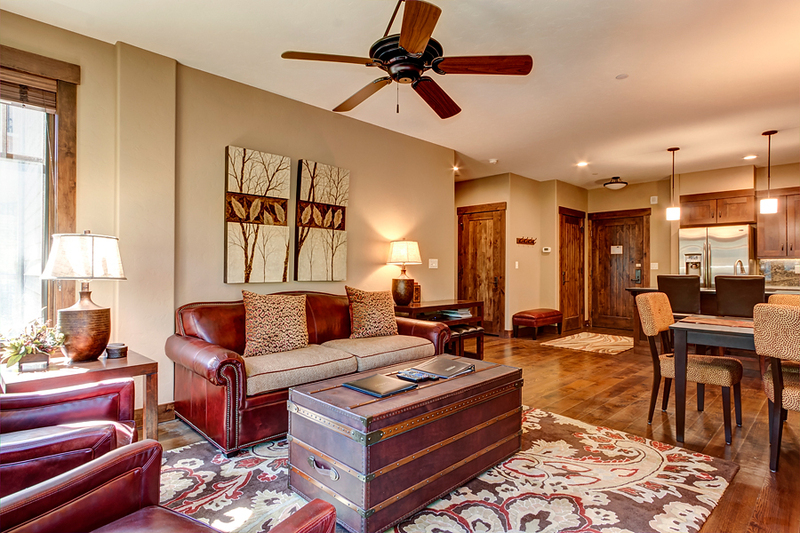 This beautiful 2-bedroom, 2-bathroom luxury condo that’s perfect for groups up to six. 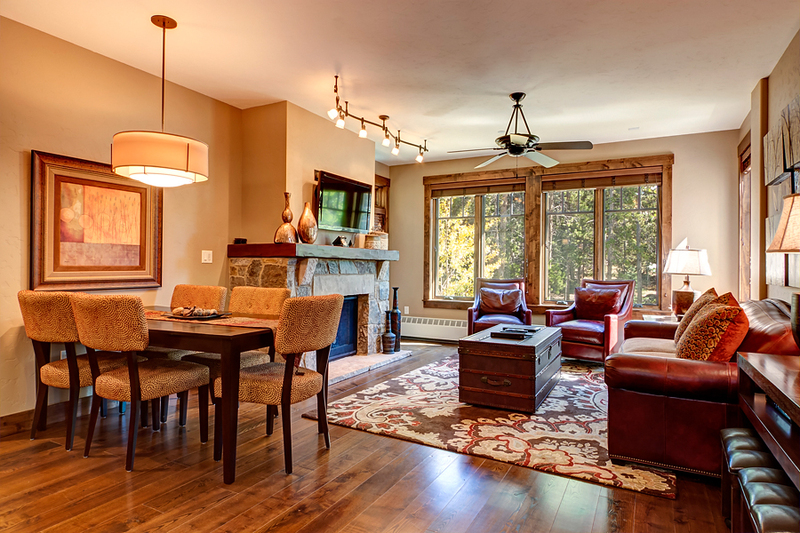 You’ll love the blend of high-country warmth, modern sophistication and high-end interior touches. The living area is airy and bright, with lots of light pouring in through large southern-facing windows. 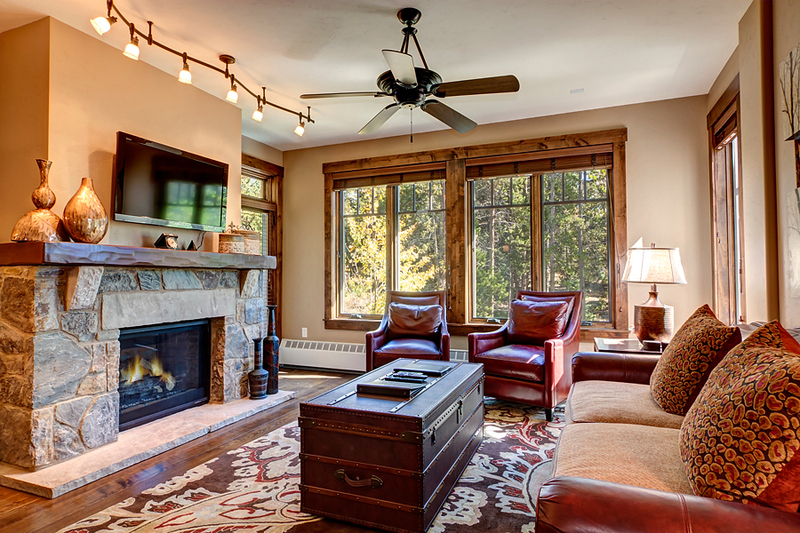 Slip into a comfy leather chair or couch and enjoy the large, stone gas fireplace and LCD TV. Or, step out to the patio for a glass of wine overlooking Illinois Creek. The gourmet kitchen is everything you’d expect from a first-rate mountain property, with granite counters, gorgeous cabinetry, stainless steel appliances, a gas range and everything your group’s chef will need to whip up après-ski snacks or memorable meals. The dining room table seats five, and there’s room for two more at the counter. There’s a full-size washer and dryer in the unit; you’ll also enjoy complimentary Wi-Fi and heated underground parking. The resort amenities are fabulous: a beautiful heated indoor/outdoor swimming pool, seven hot tubs, a fitness center, club lounge, ski locker room, ice skating on Maggie Pond and more. It’s the complete mountain vacation setting for you, your family.